For many years, cataract surgeons made incisions and removed the cloudy, cataractous lens using instruments and blades. Today, Dr. Singh performs several of these most critical steps of the surgical process with the LenSx® image-guided laser. Standard Cataract Surgery - The cloudy natural lens (cataract) is replaced with a lens implant that is permanent. Some portions of standard cataract surgery are done by hand using a blade or sharp instrument. The remainder is done using an ultrasound machine. Laser Assisted Cataract Surgery - The parts of the surgery performed with a blade or sharp instrument are performed instead with a laser. By creating a high-resolution image of the eye, the laser performs these tasks with higher precision than the hand-held blade. This may improve safety during surgery and healing time afterwards. 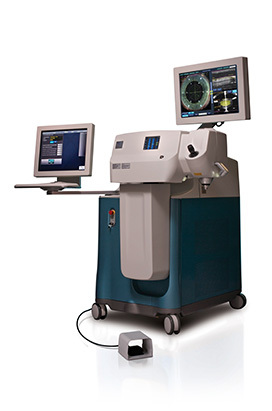 The laser will also be used to treat astigmatism. What are the benefits of LENSX® Laser Cataract Surgery?